Celeb Interviews: Rick (the temp) Campanelli | Design Chick's Blogaboo! 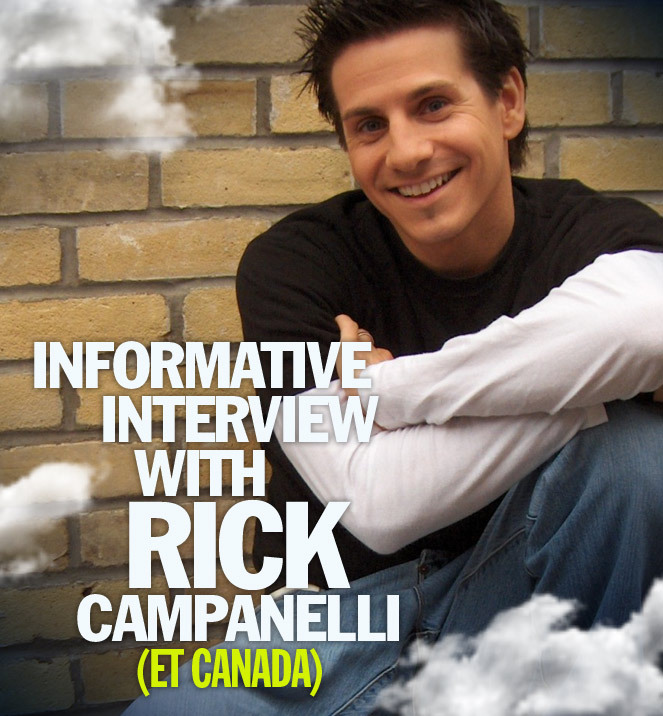 Our latest interview is with Rick Campanelli. Rick is known nowadays for his work on ET Canada. If you are like me you remember him as Rick the Temp from Much Music. He is not very tall, but he had very strong and bountiful answers to one of my questions. The rest I’ve answered for him since I think I know him pretty well. I met him years ago on the set of Much Music. I hung out with him and Pauly Shore for probably more than 64 seconds! 1) What is your favourite 90’s sitcom? 2) Do you own any music by Rita MacNeil? *this is what I think he’d say. Rita and I used to date. I used to own every one of her albums. When she broke my heart I had to burn all of them because it hurt me too much to have them around. 3) Do you have any nicknames? 5) Do you have any hidden talents? If so, please describe, or send us a video of you demonstrating said talent. During breaks on our show I entertain our cast and crew with various magic tricks. I can also devour the tail of a lizard in 7 seconds flat, no lie. 6) Do you have a favourite youtube video? If so, what? *this is what I think he’d like. 1 Response to "Celeb Interviews: Rick (the temp) Campanelli"
1 | Halloween Costume Ideas 2013. Most creative/Inspirational ever. | Design Chick's Blogaboo!